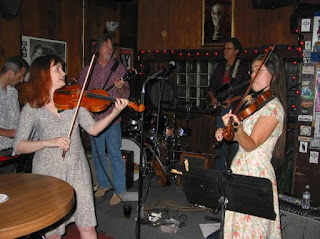 I just heard the very sad news that fiddler/singer/songwriter Amy Farris died over the weekend. I'm at a loss for words and can't believe she is gone. Amy was so talented and had this magical energy every time she played and sang. I am deeply honored that she touched my life with music and friendship. My fondest memory of Amy are the few, but very fun fiddle jams we had over iced coffee, giggles and girl talk in her cozy Silverlake apartment with her cute little dachshunds Frances and Keysha. 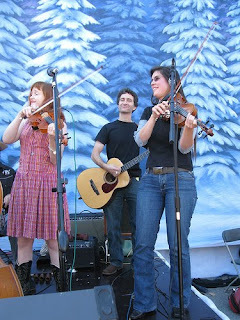 PICTURED: Me and Amy peforming with the Hollow Trees at a children's winter festival Dec 2008 and of us twin fiddlin' at the Cinema Bar Sept 2008.